My children love these cookies. They are easy and fast to make because you don’t have to chill the dough. I have found that adding European vanilla sugars give the cookies a more refined flavor; use them if you can find them. The recipe is adapted from one by Paula Deen. Preheat oven to 375 degrees. Line two baking sheets with parchment paper. Place butter in a mixing bowl and beat until smooth. Add sugars and salt. Beat until light and fluffy, about 3 minutes, scraping the bowl several times. Add extracts and mix. Mix the flour in by hand until you have a soft dough. Hand mix in the nuts. Roll dough into balls, just a bit smaller than a walnut. Place cookie dough balls onto prepared baking sheet, roughly 30 per sheet. Bake for 11-13 minutes, rotating the pan half way through baking. The cookies should be lightly golden around the edges and slightly firm to the touch. Remove from the oven. 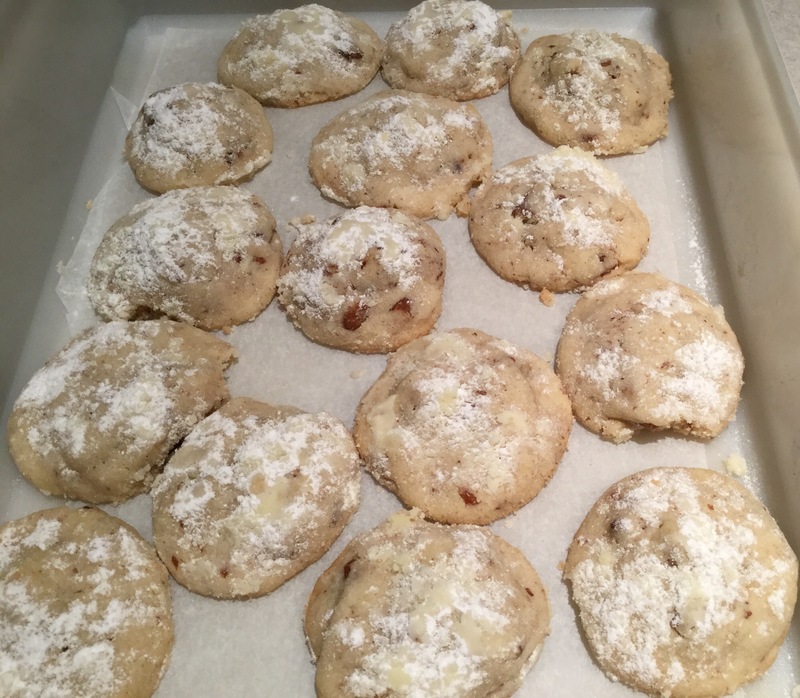 Let cookies sit on the baking sheet for two minutes, then sprinkle sifted confectioners sugar over the hot cookies. Let cookies sit 3-5 more minutes before gently removing to a rack to cool completely. Makes 5 dozen cookies.